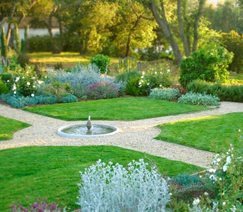 The placement of this fountain, at the intersection of two garden paths, allows it to serve as a focal point for this formal garden. Grace Design Associates in Santa Barbara, CA. When it comes to fountain placement the old mantra of location, location, location holds true. The calming sounds and beautiful sights of a well-placed fountain can transform a landscape. The number one thing to remember is that a fountain should be placed in a spot that readily allows people to enjoy it. A fountain should never be hidden in a part of your yard that rarely gets visited, this defeats its purpose. It's best to select a location for your fountain before selecting the fountain itself. This way you know how much space is available and what type and style of fountain will best suit your needs. 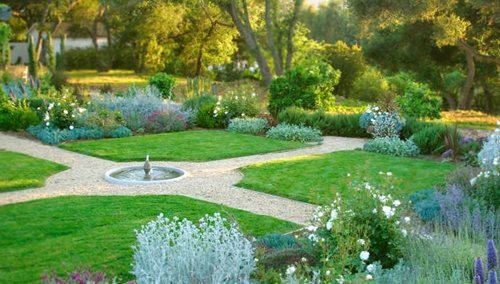 Picking a fountain with a particular area of your garden in mind will result in a cohesive and natural feeling, as if the fountain belongs there. If done the other way around, you may end up with a fountain that sticks out like a sore thumb. If your garden has a formal design a fountain should be placed in a central location where it can serve as a focal point. In this case, fountains are often placed at the intersection of two paths. If your garden has an informal design a fountain should be tucked into a corner, or placed along a garden path. The goal of a fountain in an informal setting is to serve as an accent rather than a focal point.